Description: The Fall Maritimes Tour takes us from Halifax down through Nova Scotia's South Shore where Peggy’s Cove is located onto Lunenburg to see the Bluenose II, then across the Bay of Fundy, which has the world's highest tides, and into New Brunswick. From there, we fly over the dramatic Confederation Bridge and into Prince Edward Island, and then back to Halifax. 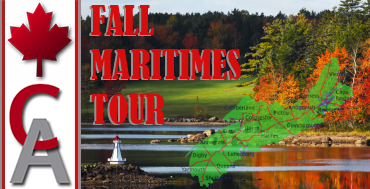 This tour was created for our pilots to enjoy the brilliant fall colors of the Maritimes maple trees which dominate the landscape this time of year!